Self-Immolation Rises As Desperate Tunisians Seek Escape From Poverty : Parallels When a fruit seller set himself on fire, it helped start a revolution in Tunisia seven years ago. Since then, the suicide method has grown more common, especially among young, unemployed men. Hosni Kalaya set fire to himself in the same weeks that Mohamed Bouazizi died from doing so in 2011 in Tunisia. He fears he inspired his half-brother's self-immolation in 2015. 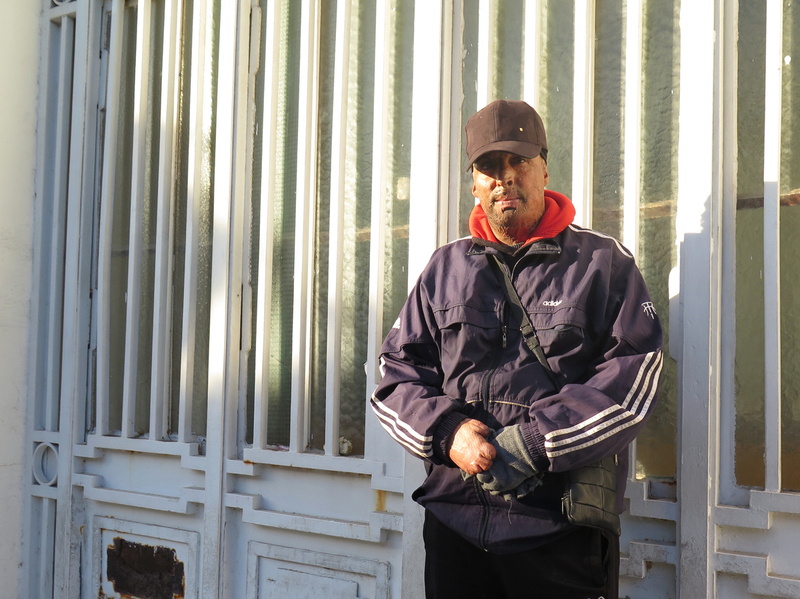 Kalaya is the less well known instigator of Tunisia's 2011 uprising. Like Mohamed Bouazizi, the fruit seller who set himself on fire after police confiscated his fruit cart, Kalaya's self-immolation in those same weeks also caused Tunisians to take to the streets in protests that ultimately forced President Zine El Abidine Ben Ali from power. But for 42-year-old Kalaya, Jan. 14 marks a much grimmer moment: He sees it as the anniversary of the moment he inspired his half-brother's suicide. "My brother was younger than me and always looked to me for inspiration," he says. "I feel guilty, because I feel that somehow gave him the idea to do this." In 2015, five years after Kalaya's desperate act, Saber Khalfati, his 25-year-old half-brother, walked to a garden near his home, poured a can of gasoline over himself and lit the match. Khalfati was not alone. In recent years, self-immolation in Tunisia has gone from being relatively rare to commonplace. 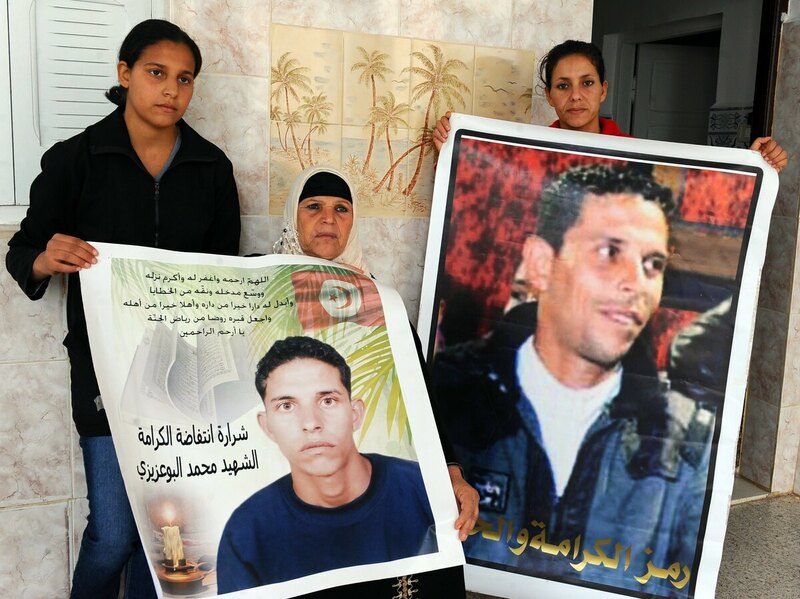 Manoubia Bouazizi (center) holds signs showing her son Mohamed along with her daughters, Basma (left) and Leila, in 2011. Mohamed's self-immolation in December 2010 was part of the impetus to the revolution that later ousted a dictator in Tunisia. Dr. Mehdi Ben Khelil, a physician at the Charles Nicolle hospital in Tunis, took part in a nationwide study that compared self-immolation fatalities in Tunisia before and after the 2011 revolution. The study, which looked at cases between 2006 and 2015, found that the number had tripled since the uprising. Khelil also has data from a more recent, still unpublished study. "I have also the figures from 2017, and I can tell you we still have three times more the cases of self-immolation as before the revolution," he says. Before the revolution, an average of 10 to 12 people per year died due to self-immolation, Khelil says. Now that figure has risen to an average of 30 to 40 people per year. Dr. Amen Allah Messadi, the head of the intensive burns unit at the Ben Arous hospital in Tunis — the main burn ward in the country — has noticed a significant increase in the number of patients admitted to the hospital due to self-immolation. He did a study that found 25 such patients were admitted in 2010. In the years since the 2011 revolution, that number grew and has remained significantly higher. In 2016, 102 such patients were admitted. Last year, it was 88 people. Khelil says that in the months immediately after the 2011 revolution, this could be explained by what's known as the "copycat effect," when people imitate an action by a celebrity or one that has been widely discussed in national and international media. "We saw pictures of Mohamed Bouazizi and his family everywhere," Khelil says. "He got posthumous prestige." This effect generally is expected to last a short while. "We would expect a decrease three years after the revolution," he says. "But what we have observed is that this increase remains high, even until now." He says most of the people who set themselves on fire are young men, mainly living in urban areas, who are unemployed or day laborers. Most used to be single. But, Khelil says, he's noticed an increase in recent months in self-immolation cases by married men. The psychological profile of the average victim is changing, too. Before the revolution, says Khelil, self-immolation victims often had a history of mental illness. But now, more and more people with no previously recorded psychological problems are doing this. 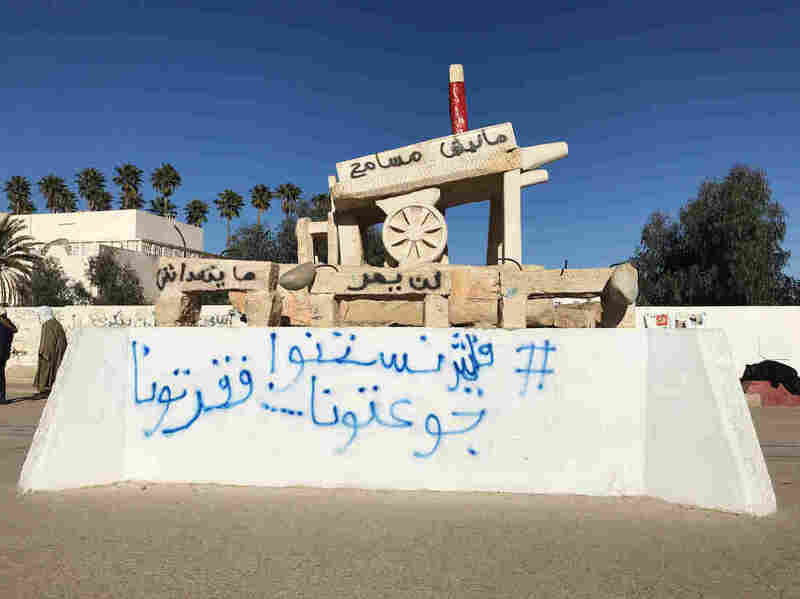 A statue of a fruit cart in the main square of Sidi Bouzeid, dedicated to Mohamed Bouazizi, the fruit vendor who died in 2011 after setting himself on fire. "We have people who know what they doing," he says. To better understand this, Khelil says, you have to consider poverty. Tunisia is struggling with an economic crisis, and many Tunisians, especially young Tunisians, cannot find jobs. Youth unemployment is at 35.4 percent, according to the World Bank. This is bitterly disappointing for Tunisians who hoped for a better future. "People were expecting a lot just after the revolution; they were waiting to improve themselves, to improve their economic capacities. And slowly they are losing hope," says Khelil. Kalaya says his half-brother Khalfati set himself on fire after he lost his job as a cleaner in a hospital in their hometown of Kasserine. "He did it because he wanted to be heard," says Kalaya. Khalfati had seen how Kalaya suffered from his self-immolation. Kalaya spent a year in the hospital, mostly unconscious. He says doctors were shocked that he even survived. When he woke, he could barely recognize his own reflection. Now, skin grafts cover his neck and face; scars drag down his lips. His ears are half-burned away, and his hands reduced to stubs. But, Kalaya says, it's impossible to understand the pain of setting yourself alight until you have experienced it. He remembers feeling terror and regret and smelling his own flesh singe seconds before he lost consciousness. 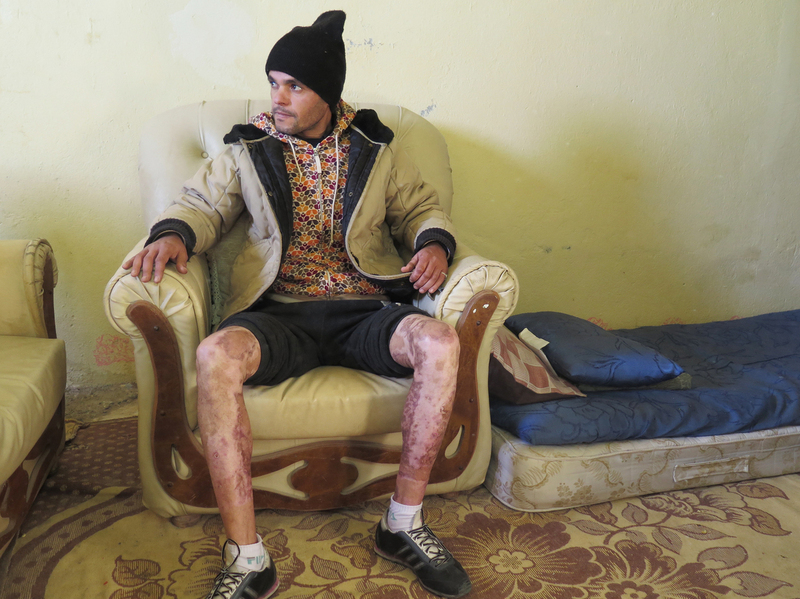 Touti Ferid, 38, shows his burn scars in his home. "If anyone really knew the pain they were going to experience," says Kalaya, "they would never have done it." Khelil, the doctor, says many of "today's self-immolation cases [are] intended as a way of getting attention, often from government officials with the power to give them a job." I wanted to do it there so the officials would know that I did this to myself and so they would feel responsible. "It's become a manner of communication. By self-immolating, the victim will have the opportunity to share his problems with others: He forces others to witness the act, and they often hope to force officials to take action on their case," he says. Touti Ferid, 38, is a self-immolation survivor in Subaytilah, a town not far from Sidi Bouzeid, where Bouazizi the fruit seller set himself on fire. He speaks with NPR on the steps of the town hall where, in December 2016, he set himself in flames. He says it was an act of desperation. He graduated in computer science in 2009, but has never been able to find a job in his field. He spent years making trips to the town hall to speak to officials about securing a public-sector job — any job. The local government promised him some, he says, but they never came through. He says the jobs often went to those who could afford to bribe officials. And private-sector jobs in Tunisia are even more scarce. "November came and left, December came, and my situation didn't change. And then my mother fell sick," Ferid says. One cold winter day, while he was at home with his sick mother, the electricity was cut off because they hadn't been able to pay the bill. Something snapped inside Ferid. "I felt helpless," he recalls. "I couldn't afford my mother's health care, I couldn't pay my electricity bill, and I have no work. And the local government humiliated me." Ferid bought gasoline from a local kiosk and marched through the front entrance of the town hall. There, in the lobby, he set himself on fire. "I wanted to do it there so the officials would know that I did this to myself and so they would feel responsible," he says. People near him in the lobby managed to put out the flames. Ferid spent the next seven months in the hospital being treated for burns that covered his legs and some of his chest. Back at his home, in a simple living room, which is also where Ferid sleeps, he rolls up his pants to reveal legs covered in skin grafts and scars. Walking can be painful, and the skin is not fully healed in some places. He needs bandages for his legs, but says he can't afford to buy them. He still has no job, and now he has to pay the hospital for treatment fees. He says debt collectors have threatened to imprison him. Many Tunisians who set themselves on fire and survive say they regret the act. Ferid isn't one of them. He says he feels so hopeless he can't promise he won't do it again.